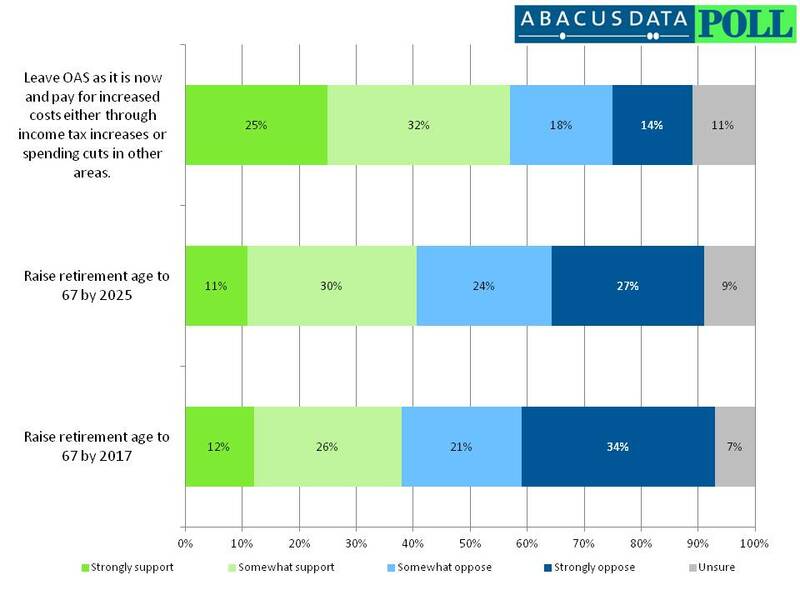 Abacus Poll: A majority of Canadians oppose raising the age eligibility for OAS to 67 by either 2017 or 2025. Respondents aged 30 to 60 are most opposed and only one in three trust Harper when he says current retirees and those close to retirement won’t be affected. A new survey from Ottawa-based Abacus Data finds that most Canadians surveyed are either very or somewhat concerned about having enough to pay for their retirement and a majority oppose reforms to OAS that would raise the retirement age to 67 from 65 by either 2017 or by 2025. When asked if they are concerned about having enough income when they retire, 47% of respondents said they were very concerned while another 33% said they were somewhat concerned. Women were more concerned than men (women 50% very concerned, men 44% very concerned) while those aged 45 to 60 were the most concerned with almost six in ten (58%) saying they are very concerned. Not surprisingly, Canadian Millennials or those aged 18 to 29 were the least concerned with 33% saying they are very concerned about having enough income when they retire. After reading a short explanation on the Old Age Security Program and the demographic trends that will impact the program, respondents were asked their opinion about three possible policy options: (1) raising the retirement to 67 from 65 by 2017, (2) raising the retirement age to 67 from 65 by 2025, and (3) leaving OAS as is and paying for the increased cost from higher income taxes and other spending cuts. Overall, a majority of Canadians surveyed opposed any increase in the retirement age. The two time frames presented did little to change opinion. On the first policy proposal (raising the retirement age to 67 by 2017), 38% of respondents supported the option while 55% opposed it (34% strongly opposed). Respondents aged 40 to 59 were the most likely to be opposed with 65% in opposition and only 29% in support of the idea. Those aged 60 and over were most likely to support the proposal with 46% supporting it and 37% opposing. Conservative Party supporters were split on the proposal with 51% supporting the proposal and 43% opposing it. NDP and Liberal Party supporters were more likely to be opposed (NDP 62% opposed, Liberal 58% opposed). When asked whether they would support or oppose a plan to raise the retirement age to 67 by 2025 or 8 years later than the first proposal, support increased only marginally to 41%. A majority of respondents still oppose the plan (51%). However, there was a noticeable shift in support among those aged 44 to 59. Politically, the longer-term option is no less risky for the Conservative government. While a small majority of Tory supporters support the plan (51%), 42% are still opposed even with the longer time horizon. NDP and Liberal supporters also remain largely opposed although 40% of Liberal Party supporters said they support the idea. A majority of respondents (57%) support the keeping the OAS program as is even if it means tax increases and other spending cuts while 32% said they were opposed. Those aged 44 to 59 were most likely to support this option (66% support) while a majority of supporters of all three parties could get behind this idea with 52% of Tory supporters, 61% of NDP supporters, and 63% of Liberal supporters saying they support leaving OAS as is but paying for the cost increase with tax increases and other spending cuts. Is the Federal Government Genuinely Trying to Approve Old Age Security? When asked which of two statements, if either, came closest to their view on retirement policy, four in ten Canadians (43%) believed that the federal government could not be trusted to reform Old Age Security because they only look out for the interests of wealthy Canadians and big businesses. Twenty-nine percent (29%) believed that the federal government genuinely wants to improve the Old Age Security system so it is affordable and sustainable for future generations of Canadians. The remaining 28% of respondents said they either agreed with neither statement or were unsure. Prime Minister Harper’s Pledge Not to Hurt Retirees or Those Close to Retirement: Do you believe him? When asked whether they believe the Prime Minister when he promised not to make changes to OAS that would affect current retirees or those close to retirement, 37% said they did believe him while 63% said they did not. Not surprisingly, answers were strongly correlated with party support: 68% of Conservative supporters said they believed the Prime Minister while 32% said they did not. In contrast, 19% of NDP supporters and 26% of Liberal supporters said they believed the Prime Minister. Perhaps most worrying for the government is the fact that only 34% of those aged 40 to 59 said they believed the Prime Minister would keep his promise. The results of this survey demonstrate that the debate over retirement policy reform is highly divisive. It pits middle-aged Canadians against those already or nearing retirement and younger Canadians. In most research on policy issues, Canadians usually divide fairly clearly across partisan lines. However, on the issue of OAS, the partisan lines are blurred with a significant percentage of Tory supporters saying they would oppose the federal government raising the retirement age to 67 by either 2017 or 2025. At the early stages of this debate, the public’s reaction to proposals with set transition periods suggests there is significant risk for the government as it decides how to approach this issue in its 2012 budget. While a slight majority of Conservative Party supports support both proposals to raise the retirement age to 67 by 2017 or 2025, a large percentage of the party’s supporters are opposed and most of those are aged 40 to 59 and those who are more likely to vote than those in younger age groups. Expanding the transition period to 2025 does move attitudes slightly among those aged 44 to 59 but not enough to make it a majority opinion among that important voting group. As retirement income remains a very serious concern for almost a majority of Canadians, if the government plans to reform OAS it has much work to do in convincing its own supporters as well as Canadians in general that it is the right thing to do. The survey was conducted online with 1,209 respondents in English and French using an internet survey platform. A random sample of panelists was invited to participate in the survey from a larger internet representative panel of 150,000 Canadians. The survey was completed from January 31 to February 2, 2012. Steps were taken to ensure that the survey respondents were representative of the population over 18 years of age. The sample distribution was balanced to match the distribution of actual census data for age, gender, education, and province. Moreover, statistical weighting was applied to the data after the completion of the survey for age, gender, education, region, and previous federal vote. Since the online survey was not a random, probability based sample, a margin of error could not be calculated. The margin of error for a survey of 1,209 respondents using a probability sample is +/- 2.9%, 19 times out of 20.